Physics Buzz: How Do Mussels Stick to Wet Rocks? Try sticking a Band-Aid to wet skin and you'll quickly realize that everyday glues are no match for wet surfaces. Mussels, on the other hand, are masters of holding fast to wet rocks, piers, and even to each other. Researchers at the University of California, Santa Barbara are studying these aquatic creatures to understand what makes them so sticky and hopefully use them as inspiration for creating synthetic wet adhesives. plaques binding it to the rock. 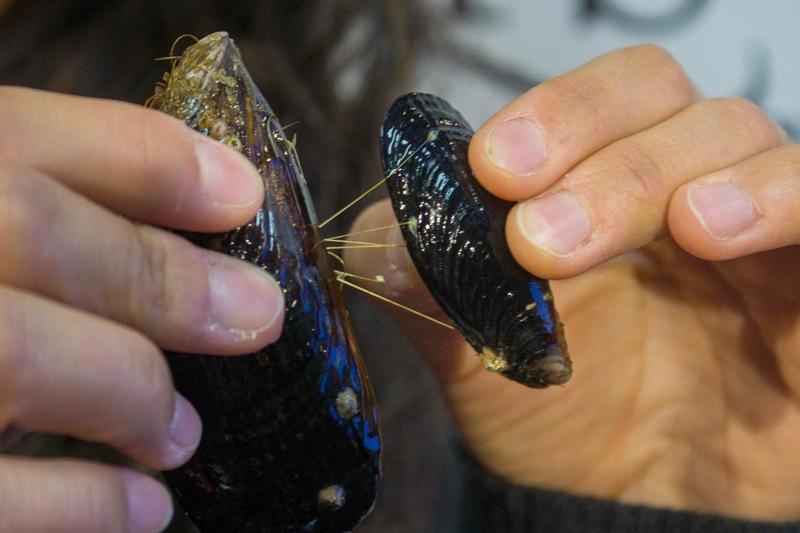 "The mussel foot protein is the champion of adhesion in the animal world," said Emmanouela Filippidi, a postdoctoral researcher at UC Santa Barbara, in a press conference yesterday at the APS March Meeting. She said individual proteins have an adhesion strength of 15 mJ/m2, which describes the amount of energy per unit area that they can withstand, and is only a few times smaller than our best man-made glues. Unlike our synthetic glues, which usually must be applied in very dry conditions, the mussel can bond to a variety of wet surfaces, even those that are dirty, relatively quickly. 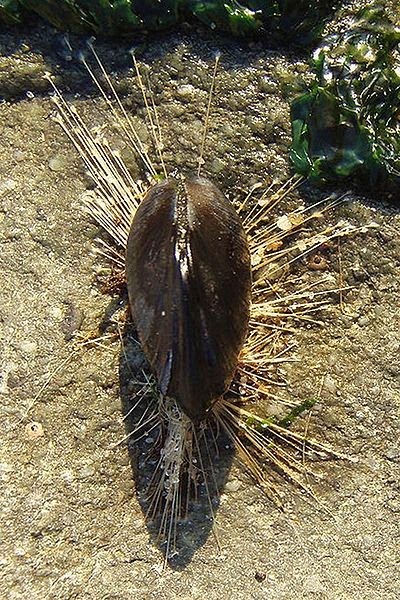 In the space of about three minutes, mussels can attach to a surface by using their foot organ to secrete so-called byssus threads that are tough and long-lasting, remaining on the rock even if the mussel goes away. Filippidi wants to understand how the plaque at the end of the threads can be so sticky. From high-resolution images of the plaque interior and from experimental force tests on living mussels in a lab, it seems that the plaque protein structure is key to its incredible binding power. Filippidi measured a total plaque adhesion of up to 15,000,000 mJ/m2, thanks to the collective action of all the individual proteins. The image below shows a foam-like structure of the plaque, with a range of large and small holes. Filippidi said the foam is similar to the structure of a bike helmet and that the two different length scales of the large and small holes effectively absorb forces to prevent the plaque ripping off the surface entirely. In this sense, the exact chemistry of the plaque proteins is less important than the overall way in which the proteins are arranged. By understanding the structure, Filippidi and her colleagues are paving the way towards future synthetic adhesives that could possibly be built from a 3D printer. In theory, this sort of structure could be scaled to different sizes and be used in many applications. Dentists would be able to apply braces without drying out the teeth first, doctors could use wet adhesives in surgery, and engineers could more easily install underwater pipelines and structures.